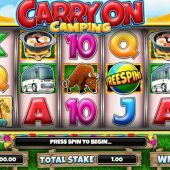 Yes, Carry On Camping is a slot based on the famous Carry On film, complete with Sid James' lascivious laugh and other soundbites. Unfortunately the scene where Barbara Windsor's bikini top pings off during outdoor exercises is not present, no melons on the reels in this game, in fact if you liked Kenneth Williams you're out of luck too as there are no fruits at all in the game ahem! There are numerous features to distract us though, as we will see. There are Wilds on all reels with no multiplier and these are the highest-paying symbols at 25x stake for 5-of-a-kind right down to the lowest card symbol at 1.5x stake. The soundtrack it the jolly 'Carry On' background music from the films. A 3D homage to Sid James appears next to the reels, with occasional interruptions to remind you he is there. You can trigger free games with 3 or more Free Spins scatters anywhere - you only get 5 but they can retrigger and you have a random modifier which can add expanded Wilds to 1 - 5 reels. There are 4 other bonuses (OK they're not all Barbara's but the subject has brought back some childhood memories!) available triggered by bonus symbols on reels 1 and 3 followed by the matching symbol on reel 5. Bab's Lucky 7's - you get up to 10 spins on a mini 3 x 3 reel slot showing only different-valued coloured 7's. Sid's Wild Night - one respin and Sid will throw a Wild somewhere on the reels which may or may not assist you in getting a win. Kenneth's Carnage - the symbols will shuffle around to award, possibly, a winning combination. Haggard's Havoc - all the symbols will be blown off of the reels and a new and possibly far better set replaces them.